MANHATTAN — Even a court order couldn't stop this bomb. 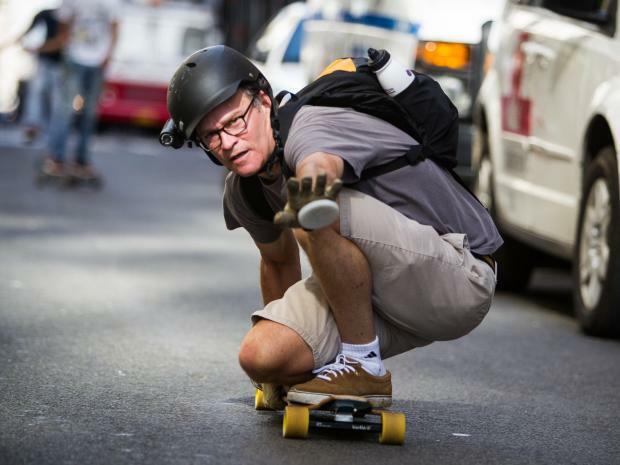 After the New York State Supreme Court ruled that the city could put the brakes on an annual longboarding race called the "Broadway Bomb" — when organizers failed to secure the proper permits from the NYPD — a group of skaters met up and tried to flood the roadway from 116th Street to Bowling Green anyway on Saturday. Though the original race — which anticipated 2,000 riders on the eight-mile course — was officially cancelled, organizers urged skaters to turn out anyway on their Facebook page. The thirty or so participants scattered soon after the meetup point, when NYPD disbanded the group, but many made the entire three-hour journey to the southern tip on solo or small-group treks. "Why did I do it? Because it's there," said Sean McCarthy, 43, of Pittsburgh, P.A. after completing his expedition. Others came from too far away not to give it a go. Casey Burnett, 22 and his girlfriend Julie Seivers, 21, along with five friends, took a Megabus at 5:30 a.m. from Baltimore, Maryland, and didn't mind that official race was banned. "This is the only place a race like this could take place in the whole word," said Burnett. Seivers added, "It's our first race together and it's been great." Passersby watched mesmerized as the would-be competitors swished by, and some even gave the racers high-fives. Bystander Richard Michaels, 45, a tourist from Dublin, Ireland, who was on Broadway in the Financial District watched in awe. "Wow. Guess you only see something like this America, right?" he said.